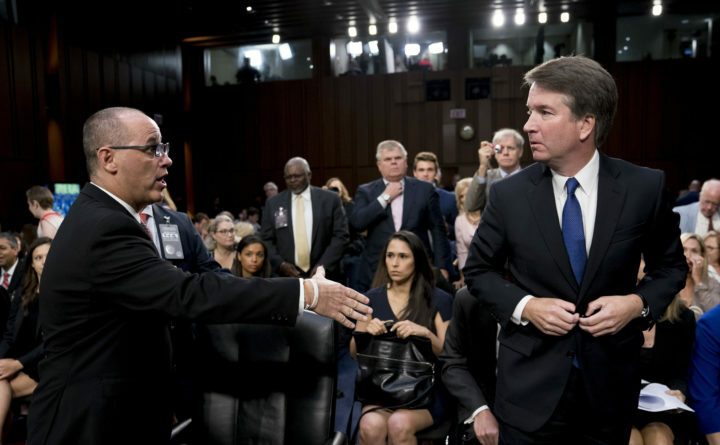 Fred Guttenberg, the father of Jamie Guttenberg who was killed in the Stoneman Douglas High School shooting in Parkland, Florida, left, attempts to shake hands with President Donald Trump's Supreme Court nominee, Brett Kavanaugh, right, as he leaves for a lunch break while appearing before the Senate Judiciary Committee on Capitol Hill in Washington to begin his confirmation hearing, Sept. 4, 2018. Kavanaugh did not shake his hand. Kavanaugh wrote in a response to questions from senators late Wednesday that he assumed the man had been a protester. WASHINGTON — Supreme Court nominee Brett Kavanaugh says he would have shaken the hand of a school shooting victim’s father during a break in last week’s Senate hearing had he recognized him before being whisked away by security detail. Kavanaugh’s explanation for the encounter with Fred Guttenberg — captured in an Associated Press photo that went viral on social media — was among a 263-page response to written questions from senators on a range of issues including abortion, executive power and his personal finances. Kavanaugh wrote that he assumed the man who approached him “and touched my arm” during a break at the Senate Judiciary Committee proceedings had been one of the many protesters in the hearing room. Guttenberg’s 14-year-old daughter, Jaime, was among 17 people killed on Feb. 14 at Stoneman Douglas High School in Florida. Kavanaugh’s security detail ushered him out in a “split second,” according to the judge’s response to a written question from Sen. Chuck Grassley, R-Iowa, the chairman of the Judiciary Committee. It was among 1,287 questions from senators, almost all from Democrats. The flood of new documents comes as the Judiciary Committee is set to meet Thursday to consider Kavanaugh’s confirmation, a vote that is expected to take place later this month. Democrats are fighting Kavanaugh’s nomination and decrying the process that Republicans used to compile his government records for review. Sen. Cory Booker, D-New Jersey, on Wednesday night released a new batch of committee confidential documents about Kavanaugh, repeating a tactic that could prompt a review from the Senate Ethics Committee. The 28 new “committee confidential” documents from Booker are from Kavanaugh’s time in the White House counsel’s office during the George W. Bush administration and show his involvement in judicial nominations, including for some of the more controversial judges of the era. Booker is being criticized by his GOP colleagues and outside groups for releasing the documents, which the Judiciary Committee is holding back on a confidential basis that makes them accessible only to senators. Last week, he released some documents that were later made public by the committee, but also others that weren’t. Wednesday’s disclosure brings the total to 75. Booker said the documents about Kavanaugh’s work “raise more serious and concerning questions” about his honesty during his testimony before the committee. At the same time, the conservative group Judicial Watch delivered a letter Wednesday to the Senate Ethics Committee seeking an investigation. It says Booker violated Senate rules against disclosing confidential documents and could face Senate expulsion. Booker “explicitly invited his expulsion from the Senate in his egregious violation of the rules and contempt for the rule of law and the Constitution,” Judicial Watch President Tom Fitton said. At issue has been the unprecedented process the Senate Judiciary Committee used for gathering documents on Kavanaugh, an appellate court judge who is President Donald Trump’s nominee to replace retired Justice Anthony Kennedy on the court. The Senate is expected to vote on his confirmation by the end of the month. Democrats have complained the process was a “sham,” as Booker put it. It also excluded any documents Democrats wanted to see from Kavanaugh’s time as Bush’s staff secretary. But Burck’s team stood by the process, according to a letter to the committee Wednesday obtained by The Associated Press. They remain willing to review documents and consent to senators’ requests for disclosure, “when appropriate,” the letter said. Despite those commitments, the letter said one member of the committee has released more than 40 documents without consent, referring to Booker. “Had we been consulted on these universally released documents, we would have consented to their public disclosure,” the letter said. White House spokesman Raj Shah said, “Despite the endless complaints from critics, the committee has received more material regarding Judge Kavanaugh’s nomination than any nominee in history.” He said senators have “more than enough information” to consider Kavanaugh’s nomination.